Psalms 118:1 Give thanks to the LORD, for he is good; his love endures forever. ​I love Thanksgiving, I really do. As a kid it was because we were going to go to grandma’s house and eat some delicious Thanksgiving dishes. Today I still love the big Thanksgiving dinner and the possibility that multiple extended family members may gather with us to share a meal. These are wonderful moments that become cherished memories, but as I get older, I really begin to look at Thanksgiving for its true purpose to give thanks, to give thanks to the Lord. ​Why do we thank God? You probably think this is a simple question and in some ways it is simple. Of course, we give thanks for God wants us to and because it is good to thank God for the things we have been given. 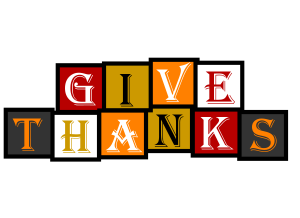 Giving thanks, however, has a deep psychological benefit for us. God knows that as we thank him, we begin to see how much we need Him in our lives. We break that sinful habit of making ourselves god of our life and of course making a mess of it. We see the brokenness of our life and how the Lord mends those pieces into something beautiful. ​We also learn to detox ourselves from the dangerous sins of pride and greed. In a nation of excess (which is a blessing in some ways), we can sometimes find ourselves competing for the next best expensive thing, anything from a phone to a house. We are bombarded with ads looking for our money. We look across the street to see (covet) the latest and greatest thing that we just can’t live without. Thanking God can put into perspective what blessings we truly have. When we take stock of what God has given us, we begin to appreciate the things we have and are enabled to move towards contentment. Also, as we give thanks to God for the things we have, we realize it’s not truly our stuff, but God’s which allows us to be generous with the things we have. Thanking God is truly good for the soul. ​What ways can we thank God? There are two terms that come to mind when talking about being thankful; thanks (of course) and adoration. Giving thanks is simply the act of seeing what God has done in our lives, to recognize the grace given by Christ and taking in account how much God has given. I will caution against thinking that we are deserving of these things, we must remember it’s not because of who we are or what we have done that God has given us these things, but rather because God is good, and loves us and He gives these things out of His goodness. ​In any relationship, there is always the danger of taking the one we love for granted and with our relationship with God, it is no different. Often if we are not careful in the good times, we may neglect our relationship with Him only to go running back when troubles arrive. Adoration is a way of thanking God for who He is and thus reminding us how important God is in our lives. It helps us remember that God is all powerful, all present, Holy, all knowing, all loving, etc. Adoration is the act of adoring God for all that He is. As we give adoration, this helps us to remember that God is the one in charge of this world, that He cares, and that God is not to be taken lightly in our lives. Adoration helps us to keep our eyes on God through the bad and the good of life. ​How and where in our lives can we start being thankful? We can begin in our prayer lives, instead of jumping into the wants we have, we start by giving God adoration and thanks. This prioritizes our prayers and lives to think of God first not self. Second, we give testimonies. Find places in your day to share with someone how God has been active in your life; give Him the credit for things you have, or things that you are doing by God’s strength, love, etc. Thirdly write a list, journal the things you have because of God and give Him praise. Finally, live for Him, allow your life to be a living sacrifice of thanksgiving. Through your life be grateful, humble and giving God thanks for everything good in your life. When should we be thankful? All the time. Thanksgiving is a great time to remember that we should be thankful, but it should not end after the meal and before the fighting over Black Friday deals. 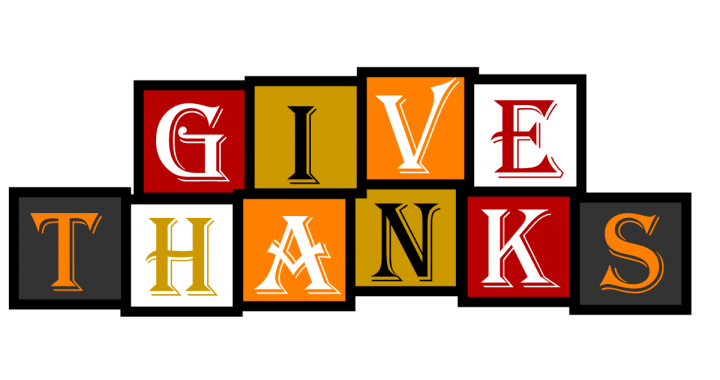 This Thanksgiving can be the start of a month, year and hopefully a lifetime that is always thanking God. It will lead to a joyous and content life, so why not start today!